Just a 3-minute walk from Roma Termini Train Station, Hotel Indipendenza is a recently renovated pleasant and simple hotel in the centre of Rome. Services available to all guests include 24hr reception, daily cleaning service, free luggage storage, a roof TERRACE overlooking the Sacred Heart Bell Tower and the rooftops of Rome, and a free Italian style breakfast (including hot drinks from the bar) to be enjoyed in a close italian coffe bar. The rooms themselves are all equipped with ensuite facilities, LCD TV, WI-FI, radio, heating, and a safety deposit box. Air conditioning is available in almost all rooms. The hotel plays host to 'Vibração' an international MODERN ART EXHIBITION by the artist FLAMINIA MANTEGAZZA, and we also have an INTERNATIONAL BOOK SHARING LIBRARY, where guests can choose a book of their choice and donate one that they no longer need. Located on the 5th floor, the hotel is reached by use of a classic and historic Otis elevator that perfectly matches the building style. 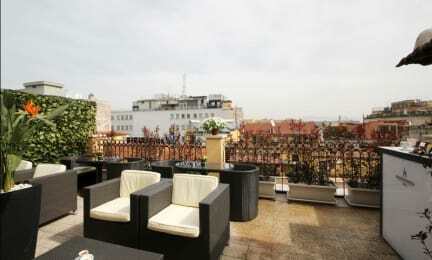 Perfectly located in the heart of Rome, guests have easy access to all areas of the city as well as further afield via the Italian overground train network, Rome’s two underground metro lines, city trams and buses and airport transport services to both Fiumicino and Ciampino airports. 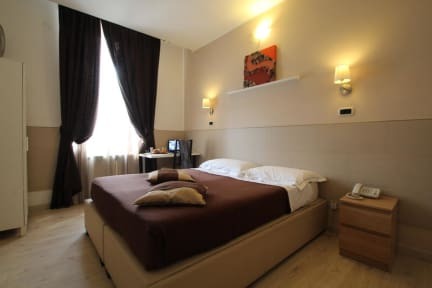 The hotel is also within walking distance of the Colosseum, Roman Imperial Forum, Spanish Steps, Dioclesian baths, Teatro dell'Opera di Roma, Republica Square, Via Nazionale, Basilica di Santa Maria Maggiore, and the university neighbourhood. RESIDENZA CERNAIA is the new annex building of the Hotel Indipendenza family, the result of experience, hard work and careful attention to detail and the needs of our guests. This depandance is located on the 4th floor of a recently renovated historic building, which includes a brand new elevator and ceilings decorated with restored frescos from the 1800s. Fiquei apenas um dia porque precisei estender minha estadia. Felizmente encontrei este hotel. Excelente custo-benefício e oferece boas comodidades, além de estar muito bem localizado.